CyberPower knows that gamers tend to take their gaming rigs (super) seriously, and this is why the new bunch of releases intend to appeal to a wide range of gamers since it comes in a variety of prices. The manufacturer of custom gaming machines has come together with Newegg to construct a trio of pre-built desktop gaming rigs, and as mentioned earlier, will be able to cater for all price-conscious gamers or overclocking enthusiasts. The systems that we will be looking at are the Gamer Ultra 2073 and Gamer Xtreme 1302/1304, where it will range from a value-based AMD Dual-Core system to a couple of high-performance gaming PCs which run on Intel’s recently introduced 2nd Generation Sandy Bridge architecture. The CyberPower systems will be priced from $439 to $1,249 will be available for a limited time only. The CyberPower Gamer Ultra 2073 is a mainstream gaming PC first and foremost, where it will be powered by AMD’s Athlon II X2 255 3.1 GHz Dual-Core CPU with Hyper Transport 3.0 Technology, sporting 4GB of DDR3 RAM, a 1TB SATA 3.0Gb/s 7200RPM hard drive and 24x DVD ±R/±RW dual layer drive. Graphics-wise, you will get a discrete ATI Radeon HD 5450 graphics card that is accompanied by an integrated 7.1 channel sound, 10/100/1000 Mbps Ethernet, Xtreme Gear USB keyboard and mouse. Available for $439.99 a pop, the Gamer Ultra 2073 is clearly something you might want to look into if you’re interested in a gaming rig that is budget-oriented. As for the uber Intel Sandy Bridge processors, they will see action in CyberPower’s Gamer Xtreme 1302 or Gamer Xtreme 1304 – being full well capable of handling any task with additional processing muscle to spare when it comes to HD video, 3D games, multitasking, multimedia, or sharing photos. Expect nothing less than stunning graphics, where you will be able to take advantage of Intel’s Turbo Boost Technology 2.0. At just $869.99, the CyberPower Gamer Xtreme 1302 clearly remains in the mid-level range, running on Intel’s Core i5-2400 3.1 GHz Sandy Bridge 64-bit ready quad-core processor with 8GB DDR3 RAM, a NVIDIA GeForce GTS 450 graphics card, integrated sound and 10/100/1000 Ethernet. 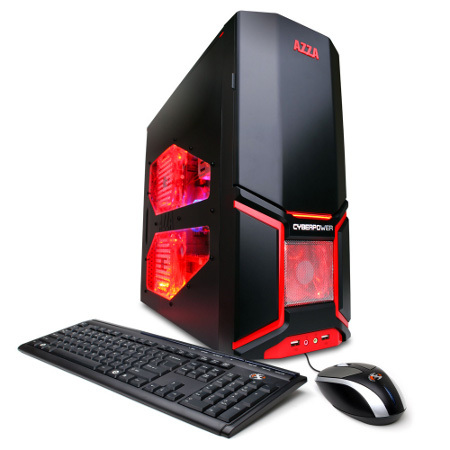 As for its storage, mouse and keyboard, they are all identical to the Gamer Ultra 2073. Last but not least, the CyberPower Gamer Xtreme 1304 is a gaming and multimedia enthusiast rig which will see the Intel Core i7 2600K 3.4 GHz Sandy Bridge processor running at the core (pun not intended) of things. Graphics-wise, it will have the assistance of the AMD Radeon HD 6850 graphics with AMD Eyefinity Technology. All systems will come pre-loaded with Microsoft Windows 7 Home Premium 64-Bit operating system, where all CyberPower systems will be accompanied by a 1-year warranty and lifetime toll-free tech support from CyberPower.